Need more information about booking Home 6603131 ? 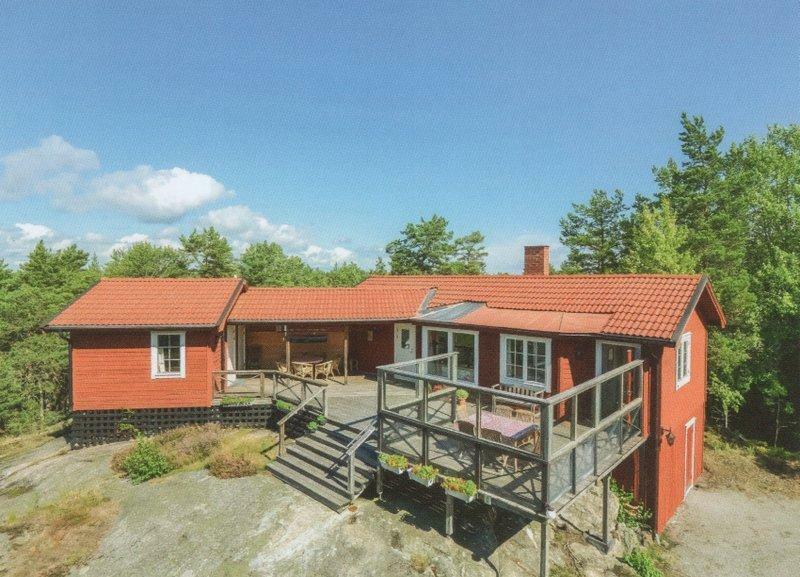 This great house is just 40 minutes due east of Stockholm at the furthest point you can easily reach by car in the archipelago. It is set in a clearing in the woods with an outlook across a wide granite spur covered in gold and silver moss. Our long jetty on to the sea is just a five minute walk away through the woods, and is available from the end of June 2015. The house is extremely comfortable with three double rooms, two bunk rooms, two shower rooms and three toilets - sleeping 10 people. It is perhaps the outside space that makes the house so special. There is one deck under cover which is fantastic on very hot or drizzly days. It is also a lovely space in the evening with a heater to keep everyone warm into the early hours after a long convivial supper. The main deck faces south for all day sunshine and one area has glass around to stop the drafts at breakfast and still catch the morning sun. Inside, the main house has a fully equipped kitchen with basic larder items - please help yourselves, replacing any items that you actually finish. There is a dining room with an expanding table for 10 people. There is a sitting area with a wood burner to keep you cosy in winter. The guest house has a small lobby, a seating area and a kitchenette with sink, fridge and hobs. It also boasts a large balcony overlooking the tree-tops with wonderful sunsets. There are plenty of outdoor chairs and tables and a few sunloungers. There is also a gas BBQ, a gas hob and an electric frying pan, all of which can be used outdoors to avoid being stuck in the kitchen! Stockholm boasts the same number of annual sunshine hours as Rome, and with short winter days this means that Sweden generally has good summers. There are two wonderful lakes, both within a 15 minute walk. Skepparviksträsk has a little beach area and a safe shallow walk in. It is great with small children and faces due west to catch a last minute dip before sundown. There are other places to sit around the lake, but this is the first point, and the easiest. At popular times there may be one or two other families joining you, making it quite sociable. Sågträsk is a little more remote and you are almost always alone. The closest point has a lovely shallow-sloping rock dipping into the water, but it becomes deep very quickly. The rock is slippery below the water line, so there are steps to help you out. In good weather the water can get very warm as the rocks radiate heat. Both lakes are incredibly beautiful, but this one is our favourite. The sea is just a four minute walk away. There is a small shingle beach and our long jetty which you can tie a boat to. It faces due south and west for stunning sunsets, and is a great place to lie out during the day. Alternatively, amble through the woods to a rock slab by the sea facing south. Malma Kvarn is a sailing school about half and hour's walk away, or about 5 mins by boat. It has a little shop selling sweets and ice-creams. During the summer season it also boasts an excellent restaurant which must be booked. There are many lovely walks through the woods which, at the right time of year, are host to wild strawberries, raspberries, blueberries, lingonberries and a plethora of delicious mushrooms such as chanterelle and morel. Walk quietly and you might even catch sight of a deer or an elk. Last year there were two brave elk who came quite close and really impressed/terrified our guests! If you have a boat - even a small one - the islands of Sandsher and Korsholmen are just minutes away with beautiful places to moor and perfect for day trips, evening picnics or camp-overs. With a larger boat there are wonderful islands further out to sea with wide expanses of smooth rocks. The house is right in the centre of Stockholm's Skärgård, with an infinite number of islands to explore. Heading inland by boat you can get to Strömma in about 15 minutes for ice-creams, a cafe and a great restaurant - the sea is always flat calm in this direction. On the way is a large area suitable for water-skiing and donut-ing if you have the equipment. Beyond Strömma, and another half-hour by boat, is the magical 'Artipelag' - a beautiful modern museum with excellent restaurants. For a real treat, go to Stockholm by boat. It takes about 2.5 hours. The water in the harbour is choppy as there are a lot of big boats using it, so this is not suitable for a tiny vessel. One of the most lovely ways to see the archipelago is to take a morning ferry out to Sandhamn from Stavsnäs - about 20 minutes by car. This passes through the magical archipelago, dropping passengers at little jetties on islands dotted across the landscape. Sandhamn is an old settlement with beautiful houses. There is time to explore the island and its architecture, oggle at the posh boats in the posh marina, and enjoy a delicious lunch at one of the restaurants, and still catch an evening ferry back. Stockholm is also home to handsome architecture and most of it is on the water. Often called the 'Venice of the north', it is very beautiful and well worth a visit. There are great museums - particularly the Vasa museum - housing a wooden battleship that sunk on its maiden voyage around 1628, and Skansen - an outdoor park with zoo and a taste of Swedish living 100 years ago. There is much to be said for Stockholm - check out the websites! There are two excellent golf courses. The closest is Fågelbro - a 10 minute drive - which also has good cafes, restaurants and a leisure centre (gym, tennis, sauna, jacuzzi etc) for which you can buy day passes. There is also a tennis court for hire by the hour at the Fågelbro Hotel. The other golf course is at Värmdö, about 20 minutes away. There is Crazy Golf at Djurö about 15 minutes away. Fishing - anyone can fish in the sea. There is also trout fishing in one of the local lakes - Mellansjön - you can buy a licence from Grisslinge and use one of the rowing boats that are provided. There is a petrol station with basic groceries about 10 minutes away towards Stavsnäs and Djurö. There are also supermarkets and bakeries at these two towns, both about 15 or 20 minutes away. The best supermarkets and shops are at Mölnvik near Gustavsberg, about 25 minutes by car. There is a Systembolaget at Mölnvik to stock up on alcohol! I believe you can also pre-order alcohol from ICA supermarket in Stavsnäs and pick it up from there the following day. If you are out in the islands there is a small shop, petrol pump and cafe at Guns Livs on the south-eastern side of Nämdö. The house is ready for winter tenants. There is a central wood burner and electric radiators in all the rooms. During the winter people skate on both the sea and the lakes, and do cross-country skiing. Sheets and towels are not normally provided, but can be pre-ordered and beds prepared for an extra Skr150 per person. We do ask that you leave the house clean and tidy ready for the next tenant. If you require help with this please ask ahead. The cost is Skr250 per hour. For short term lets (up to 3 weeks), electricity is included. For longer lets with significantly cheaper rental costs, electricity is billed according to use.